When I was on holiday on the Gold Coast in Queensland, I saw lots of blue blubber jellyfish in the ocean. These interesting jellyfish can grow to up to 45 cm across, with 8 stumpy arms that they use to catch plankton to eat. 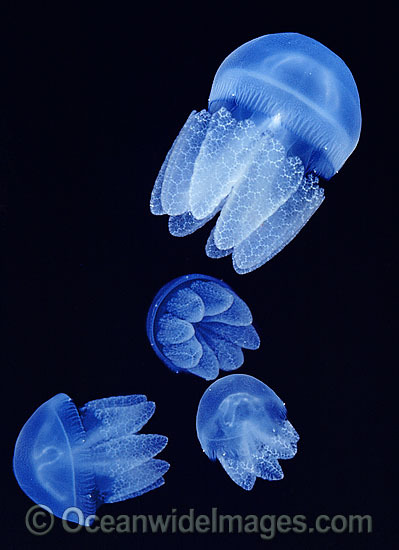 Whilst they are called blue blubber jellyfish, they range in colour from white to light blue to dark purple. Their major predators are sea turtles (especially leatherback turtles) and fish. As turtle numbers drop, jellyfish numbers have the potential to become a problem. Each of their 8 arms has a little mouth at the end, that they use to transport food to their stomachs. They also have a poisonous sting, but they are not considered a danger to people, although they can be painful. Blue blubber jellyfish are very common and can be found along the eastern and northern coast of Australia. Are there any other interesting facts that you would like to share about blue blubber jellyfish? p.s. you do not have to do this but i think it would be better with more facts and they were great facts that you had it really helped with my report. I got badly stung by one surfing on Gold Coast yesterday- I was searching for research on the sting as it burned for a good hour or so and too painful to drive home! The sting was down the entire back of my thigh !